A new series of postage stamps celebrating four U.S. justices includes Louis Brandeis and Felix Frankfurter, two of seven Jewish justices in the history of the High Court. Brandeis, a Zionist who once said, “To be good Americans, we must be better Jews, and to be better Jews, we must become Zionists,” was known as the “people’s justice” for his defense of civil liberties. He served on the Court from 1916-1939. Read more about Brandeis in Moment’s review of Louis D. Brandeis: A Life. Frankfurter, the first naturalized American be to appointed to the Supreme Court, served from 1939-1962. Before joining the Court, he was an adviser to FDR and a friend of Brandeis. Read more about Jewish justices in Moment’s cover story about religion and the Supreme Court, where scholars discuss whether the religious beliefs of justices influence their legal opinions. The fall TV season has started, but there is one summer show you should make sure to catch up on (and with four minute long episodes that shouldn’t be too hard). Road to the Altar, a Web-only TV series, stars Jaleel White of Urkel fame and Leyna Juliet Weber as White’s fiancée, Rochelle Shapiro. The series tells the story of the couple planning their nuptials, with each episode featuring one item on the wedding to-do list (the caterer, the flowers, the band etc). Rochelle (like Weber who is also the show’s co-writer) is Jewish, and tribal references abound throughout the show. The best is when Rochelle’s ultra-Orthodox cousin, Ruchel Leah, flies in from Brooklyn for a bridesmaid dress fitting. Ruchel’s Borough Park-style outfit covers her legs, arms and neck, confusing White’s character Simon who can’t understand why her Jewish traditions vary from Rochelle’s. Rochelle plays the Jewish princess pretty typically—self-absorbed, demanding but very funny, while White plays the straight man to Rochelle’s frenzy. Admittedly, it’s a little tiring to see the the high-strung Jewish city girl character rehashed again (especially on the innovative webisode format). But aside from that, the stories are fun, the scripts are well-written and the timing is spot-on. 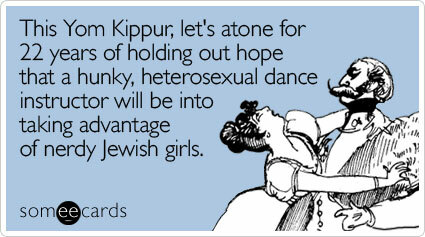 Besides, where else could you hear a hip-hop Hava Nagila? Here’s a great idea (trust us, we’ve gotten to try it courtesy of our friend Jenna at ModernDomestic) for a delicious treat that’s especially wonderful for Rosh Hashanah: A scrumptious apple and honey challah! Although Jenna isn’t Jewish, she talks about her appreciation for the interesting connections Judaism has with certain foods. Jenna brought over her challah to Moment‘s office last week for a taste-test. We gave it the Jewish grandmother’s seal of approval. Twitter parodies have become pretty stale, and no one could beat the mom translator sketch on SNL earlier this year, but Twitteleh: Twitter for your Jewish Mother made my day. 2. What have you eaten? 3. Are you wearing a sweater?